Those staying at the GEM of historic Bed and Breakfast gems are sure to be swept off their feet by the eloquence and Victorian charm lavished upon them by Proprietor, Heather Bryson. Some guests swear they’ve journeyed back into times of yore, with old-fashioned chivalry, home-away-from-home comfort, and unique 19th and 20th century furnishings surrounding them. In fact, while relaxing on the Gable House's wooden wrap-around porch in this picturesque neighborhood, one can easily imagine horse-drawn cutters clopping along, with couples dressed in all their finery, on their way to bat about town. The Gable House, named for its stunning Queen Anne Victorian architecture, with four ornate gables adjoining the main roof, impressive turret, and balconies, has been standing 3-stories tall for 120 years, and is one of Durango’s treasured landmarks. It is listed on the National and State Historic Register and it is quite apparent that this magnificent edifice has been lovingly and precisely restored to its historic elegance. It is also impeccably maintained by its joyful owners. Surprisingly, the quiet, tree-lined street on which The Gable House B & B sits, is only minutes away on foot, from bustling downtown Durango and the town’s claim to fame, the Durango Silverton Narrow Gauge Railroad. There are plenty of free parking spaces allowing guests to make tracks to explore the many wonders of this “water town” including, of course, the Animas River where people flock to fish, frolic, and float. Confer with the owner, Heather, on how to gain an unforgettable day or night on the town. Pick up a favorite novel at the mercantile to read later at home amidst the flourishing garden on the patio, up high in the attic room, down in the parlor, or on your own private balcony or bedroom window seat. Wake up to an absolutely scrumptious hand-made and home-spun, hearty breakfast! Farm fresh eggs make for delicious SW breakfast burritos (a local favorite), poached eggs over Mexican Spoon Bread, breakfast casseroles, and veggie, sausage or cheese quiche. Fruit, Greek yogurt, muffins, flap-jacks, and listening to interesting facts about the history of the region, are all great additions to the menu! Adding to the ambiance is the Blue Willow China accompanied by vintage SILVER ware. “Sink Me Chaps! The Gable House is a real find!” An intimate setting, great location, ace-high hospitality, comfortable nest with private bath, and mouth-watering breakfasts! It’ll WOW any gal’s bonnet right off her purdy little head. 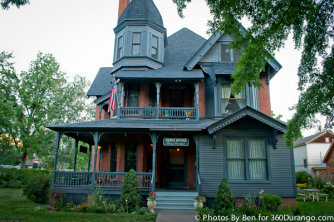 Gable House B & B Photos! DSNGRR & the town of Silverton!